On September 11, 1857, a band of Mormon militia, under a flag of truce, lured unarmed members of an emigrant company from their fortified encampment and, with some Paiute Indians, killed them. More than 120 men, women, and children perished in the slaughter. 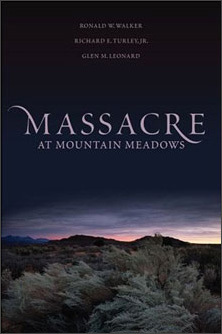 Massacre at Mountain Meadows offers the most thoroughly researched account of the massacre ever written. Drawn from documents previously not available to scholars and a careful re-reading of traditional sources, this gripping narrative offers fascinating new insight into why Mormon settlers in isolated southern Utah deceived the emigrant party with a promise of safety and then killed the adults and all but seventeen of the youngest children. The book sheds light on factors contributing to the tragic event, including the war hysteria that overcame the Mormons after President James Buchanan dispatched federal troops to Utah Territory to put down a supposed rebellion, the suspicion and conflicts that polarized the perpetrators and victims, and the reminders of attacks on Mormons in earlier settlements in Missouri and Illinois. It also analyzes the influence of Brigham Young’s rhetoric and military strategy during the Utah War and the role of local Mormon militia leaders in enticing Paiutes to join in the attack. Throughout the book, the authors paint finely drawn portraits of the key players in the drama, their backgrounds, personalities, and roles in the unfolding story of misunderstanding, misinformation, indecision, and personal vendettas. The Mountain Meadows Massacre stands as one of the darkest events in Mormon history. Neither a whitewash nor an expose, Massacre at Mountain Meadows provides the clearest and most accurate account of a key event in American religious history. Massacre at Mountain Meadows is available in hardback, electronic, and audio formats.